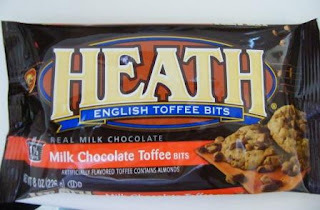 This weekend I made Heath brownies to have when youngest son came over -- he came for dinner both Saturday and Sunday. They were very simple to make. You can either use your favorite home made brownie recipe or your favorite brownie mix. I used Duncan Hines triple chocolate brownie mix and made them according to the package directions for "fudgy brownies" that uses only 1 egg. I baked them per the directions and as soon as they came out of the oven, I spread an 8-oz package of Heath toffee bits over the top and then immediately covered them tightly with foil. Keep them covered on a rack until completely cooled. These would be a great brownie to use if you wanted to make a brownie sundae...and of course, they are good simply "as is". You can check them out below!